I have written at length about authorized Church Literature, how every “good” Christian Scientist has at least three copies of Science & Health, and how even the Right Dictionary can make a difference. I recently visited a friend who had several bookcases full of CS-related literature – Bound Volumes, multiple copies of the KJV Bible – reader’s edition, study edition, personal copy, other translations of the Bible. They also had multiple copies of S&H – reader’s edition, study edition, personal copy, paperbacks to give away, other translations. Added to that were several biographies, boxes of Sentinels, Journals, pamphlets, etc. They also had reams of lectures, talks, papers presented and binders of notes from their CS Class Instruction and Association. Looking at the pile of beautiful leather bound volumes (at least 2-3 sets) I started to wonder about the cost of Christian Science – not the emotional toll, or mental gymnastics, but the monetary costs of fully participating in the religion. To that end I’ve compiled what I’ve termed the “starter set” the necessary and recommended additional books for people who are starting on their CS adventure, and associated supplies necessary for lesson marking. I have also included a breakdown of subscription costs as well as the most likely subscription options further down. There are additional hidden costs as well, Bible Lesson Cozies, bookcases/storage solutions to hold all of the CS-lit, some sort of protective cover/carrier for the books, but I’ve not included those as they are extra-optional, and even harder to quantify. I have also chosen not to quantify costs associated with church attendance/participation, use of CS Practitioners/Nurses, CS Class Instruction/Association, and other various CS social groups/camps, etc. as those are far less concrete and participation in them varies greatly. For simplicity sake, I’ve chosen to focus only on AUTHORIZED LITERATURE and all prices are directly from official TMC resources. I also opted for the “starter” variety of books – very few people start with the beautiful bound leather volumes, most begin with paperbacks, or the less expensive hardback set. Please keep in mind, this does not include a subscription the Bible Lesson Citations only, which is an additional $24/year – assuming you choose to mark your books. You could also choose the Full Text Lessons which are $120/year, or the online subscription option eBible Lesson which is $168.22/year. Could you get all of this cheaper somewhere else — or second hand, or possibly even FREE? Yes, but that would undermine Church profits and don’t you want to support your local Reading Room? At this point, I feel I must confess, with the exception of a dual-language S&H I don’t think I’ve actually bought any authorized CS lit aside from the Full Text lesson subscription – most of the CS Lit was given to me, often second hand, and I never really bothered to mark my books (and other than Readers I’m not sure who does). Once you’re past the initial start-up costs, the only remaining continual costs are of subscriptions – for Bible Lesson citations, the Journal/Sentinel/Herald or CS Monitor, any online subscriptions (more on all that below) and additional reading materials (more biographies, pamphlets, study references). Obviously the nicer your books and the larger your collection of CS lit, the more you have progressed with your spiritual growth, and God will find ways to reward you (usually by showering you with more CS lit). There are a total of 21 subscription options, for the purposes of this cost analysis we will assume people live in the United States and speaks English. 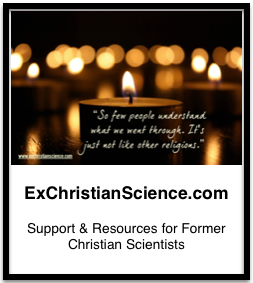 Everyone is strongly encouraged to subscribe to at least one periodical, and because every good Christian Scientist marks their books (and regularly reads the lesson), the Quarterly, Full Text or online eBible/MyBible Lesson is a must. From what I have observed most CS either subscribe to the Journal or the Sentinel, most prefer the Full Text over the Citations Only (even if they mark their own books), and eBibleLesson online is more popular with adults, while MyBibleLesson is more for teens and Sunday School teachers. The CS Monitor is a popular news source, but I am unsure about subscription rates. I used to enjoy reading the Monitor daily while I attended Principia before they cut it down to a weekly edition. Growing up, my parents had Concord software for their computers, but I don’t think they purchased the new edition. Most of my Sunday School teachers used it at one point or another, and many Church Reading Rooms have a computer tucked in the back with a computer that runs Concord. The Journal/Sentinel/Herald (JSH) Online is the best deal for $144 a year, but unless you’re a CSP or frequently need to access back issues, it seems unlikely you’d subscribe. Many Reading Rooms also have “Bound Volumes” of these, and depending on the lineage of the membership some date back to the very early years of the movement. eBible Lessons are a better price for what is offered than the Full Text, but you’d have to print out the lessons (or read them on an e-reader or your computer). Concord Online is a neat feature, but much of Ms. Eddy’s work is available through either official church websites, GoogleBooks, or various unauthorized outlets. It takes a bit more time to find what you’re looking for, but if you don’t want to spend $71.88/year there are options. I was unable to find the “newsstand” price for the CSMonitor, and I’m wondering how much it costs to put together and how heavily it is being subsidized by other things. I see a lot of the offerings as either/or, either you subscribe to the eBible Lessons or MyBibleLessons or the Full Text, either the CSM Online or the CSM that arrives weekly in your mailbox (or you just read the free content online, of which there is a fair bit anyway). I believe there is also a CSM-Kindle subscription. I think this is done as an attempt to reach the widest audience available, but there seems to be a noticeable shift towards the online and e-features (cheaper for them options). Fate vs. Freewill: Did Jesus have a Choice? Interesting…I shudder at the cumulative cost of the reference library I amassed before I wised up and left the faith, although it wasn’t nearly as extensive as your friend’s library. I’d say I was in for at least $400 or somewhere in that neighbourhood. I also subscribed to the Journal and Sentinel (print)–the on-line offerings weren’t as extensive as they now are. I recall hearing via the grapevine when I was still toiling away at TMC that they wanted to eventually move completely or at least largely away from print subscriptions. Much lower cost (to them). I suspect much of the CS lit my friend amassed was “donated” to them. CS lit is very difficult to get rid of so the devout pass it along to other devout or if they’re very lucky, a Reading Room will take some of it. The assorted piles of CS Lit that had amassed around Prin – each house and most of the buildings have at least one CS Study Room – was truly terrifying.